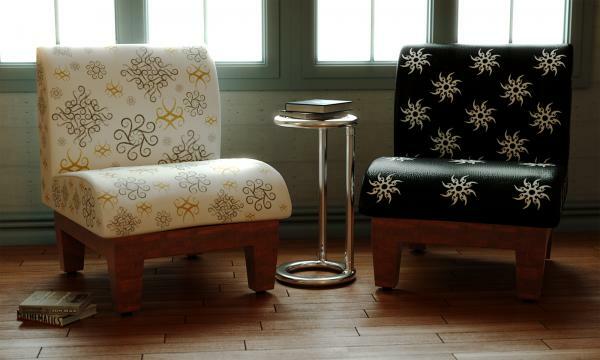 Slipper Chairs are armless, upholstered chairs with a low seat and short legs. Historically used in a lady's bedroom to assist her in getting dressed. They are smaller in scale than traditional chairs, and sit much lower than a dining chair. This model was created by me in 3dsmax 2012. The chair comes fully textured, with it's own high resolution color, reflection/specular, and bump maps, suitable for close-up rendering, but you are also free to apply your own procedural texture if you desire. I have also provided 2 distinct color and bump maps for the cushions, which you can swap out to fit the color situation of your renders. The base and legs are a wooden texture. You can use the same specular and bump maps with each of the color textures. The .max 2012 scene file also comes complete with a simple windowed room, and a BONUS modern side table (unfortunately, this bonus table is not included in .obj format). Please read the included README file for further information, and instruction details on how to load the .obj versions into your favorite 3D application, especially for Poser users. Marck23mt (1 year ago) Inappropriate? Catlin (2 years ago) Inappropriate? digi (4 years ago) Inappropriate? labrat (6 years ago) Inappropriate? This is really nice. Can be used in so many situations, and it does not look cartoonish! Thank you very much.